Assassin's Creed IV Black Flag Sony PlayStation 3 PS3 Video Game Condition is Brand New. The cellophane is starting to tear and has a few spots of tears. Game has not been removed or opened. Take charge of a pirate ship and rule the waves as pirate captain Edward Kenway when you play Assassin's Creed IV: Black Flag. This chapter in the Assassin's Creed saga pairs with the Sony PlayStation 3 and demonstrates the reality of the pirate lifestyle during the age of mythic figures like Blackbeard and Benjamin Hornigold. Travel to 50 different sites in the Caribbean and the surrounding area and wield classic weapons like cutlasses and flintlock pistols. In your ship, the Jackdaw, you will sail the seas with your carefully selected crew. Double the fun when you join friends for a multiplayer game that is as cutthroat and fierce as the genuine pirates themselves. 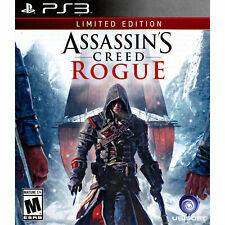 Ubisoft 4th assassins creed release and this one is the one that put them on the map. Black flag and the collectors edition is for every type of gamer. Its so good it even caused a game to launch its own francise, skull n bones. So I'd say everyone should have a copy. The best adventure,fighting,exploring game of its time and still holds up against all the newer games. Definetly one of a kind. This collectors edition is also one on its own. The flag in the set is not cheap its very well done. Better then most flags that are of more importance. So yes you'd be crazy to not have one of these collector editions. Assassins Creed 2 is still the best AC but Black Flags still a must play! great game ,different form most other assassin's creed. love it can play for hours at a time with being bored. One of the greatest games to surface in the past few years, along side of GTAV, The Last of us & Tomb Raider. Everything about this game is exciting & fun. The naval battles you engage in are one of gaming's finest. There is only one down side to this game that I can think of, the lack of naval multiplayer. Other than that, this game is a must have. Tomodachi Life Nintendo Selects (Nintendo 3DS, 2016) Brand NEW ! !